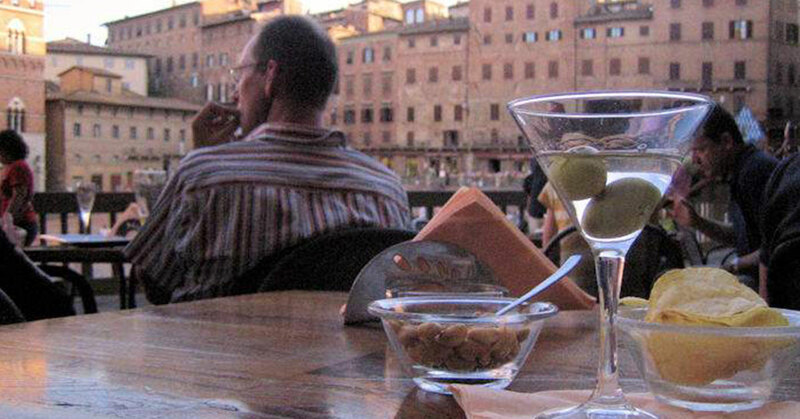 I was having an aperitivo in one of the most beautiful squares in Italy, Piazza del Campo in the medieval town of Siena. Taking a short break from my travel career, I was attending Italian language school in the summer of 2005 to enjoy some life-enriching activity. Travel during the previous 10 years consisted mostly of 4-day familiarization trips to various places to see all 6 room categories of the 10 most popular hotels in each of the destinations. It was as glamorous as it sounds. As I was practicing my daily lesson, I happened to notice an interesting juxtaposition come clearly into my view. Entering on the right was a smartly dressed woman carrying a bright yellow umbrella followed by about thirty curious onlookers. They stopped and huddled closely together to hear her narrative about the famous square. At the same time, entering into the left of my view came a young couple holding a large map and guidebook, reading intently and looking up in awe at the magnificent buildings that surrounded the square. They were all most undoubtedly learning more about the Palio horserace which was about to take place in the square in a matter of days. Observing the two visitor experiences unfolding in front of me, I noticed this large, conspicuous gap between them, literally and figuratively. The ideal, I thought, would be to have a local private guide in a small group of no more than 10 or 12 bringing the square to life in a personal, intimate experience. When they say many businesses start on a cocktail napkin, we can include Villa Vita International to this list. I began to jot down a few notes but quickly ran out of room as my hand struggled to keep up with my thoughts. Tucking the scratched up napkin in my bag, I was off to my next stop, a lovely paper store to purchase a beautiful handmade Italian journal. Heck, I needed it anyway for my language lessons! This was about the time when small group travel was emerging as a new trend with the larger tour companies and Rick Steves was at a new height of popularity. Staying in family-owned countryside B&B’s, farm-stays instead of larger chain hotels and immersing more into local cultures with cooking and language lessons, art and photography, harvest holidays were capturing more of the mainstream travel interest. And what better place to experience than Tuscany with its rich history, beauty, culture and people, I thought. My notes that day included villa-based stays with drivers, excursions to some of the most beautiful places I had been experiencing during these weeks at the school, dinners at family-owned restaurants that are normally only enjoyed by locals, and classes to bring home knowledge in addition to photos. Presto! Villa Vita soon sprang into life. I began to collaborate with villa owners, restauranteurs, guides, drivers, and teachers. By April 2006, a corporation was formed as were lifelong friendships with business partners and clients alike. For over 10 years now, our week-long Inclusive Tuscany programs consist of countryside stays in beautiful hilltop estates such as Il Borgo di Villa Bossi Pucci with daily excursions to various breathtaking towns including Florence, of course with small group walking tours led by passionate and knowledgeable local guides. Our drivers bring our guests to charming neighborhood restaurants each night to dine with the locals for authentic family recipes, often paired with their own family wines! We always include country kitchen cooking lessons, vineyard tours and tastings, and offer optional classes in art, photography, language, ceramics, wine production and more. We continue to add new activities and excursions as many of our guests return again, and again. One of our guests said it was more like visiting their Italian family than going on vacation. There is no nicer compliment than that! And yes, I still have the bar napkin.